New and older lava flows clustered in the Tvashtar region of Jupiter's moon Io appear as hot spots in a temperature map from NASA's Galileo spacecraft. The multiple hot spots indicate continuing shifts in the location of Tvashtar's eruptions since the region's volcanic activity was first seen in December 1999. The temperature map (top) uses infrared observations made during Galileo's Aug. 6, 2001, flyby of Io. 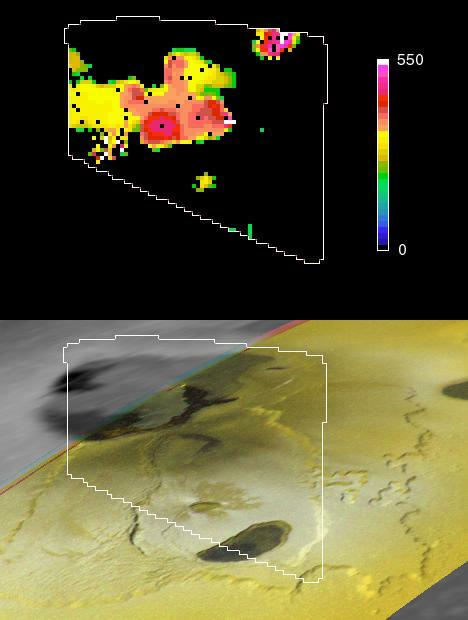 It is shown using landmarks from a February 2000 visible-light image (bottom) that Galileo's camera recorded of the Tvashtar area of bowl-like depressions in Io's northern hemisphere. The temperature map comes from Galileo's near-infrared mapping spectrometer. 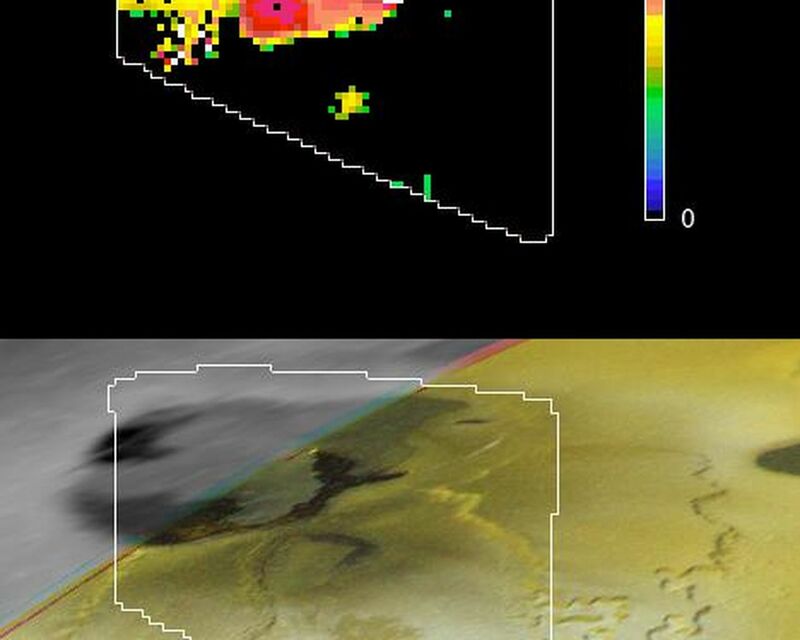 Tvashtar has been a very active region since December 1999, when Galileo detected a major eruption from the location marked A (See insert image below). The eruption from A was interpreted as a row of lava fountains. 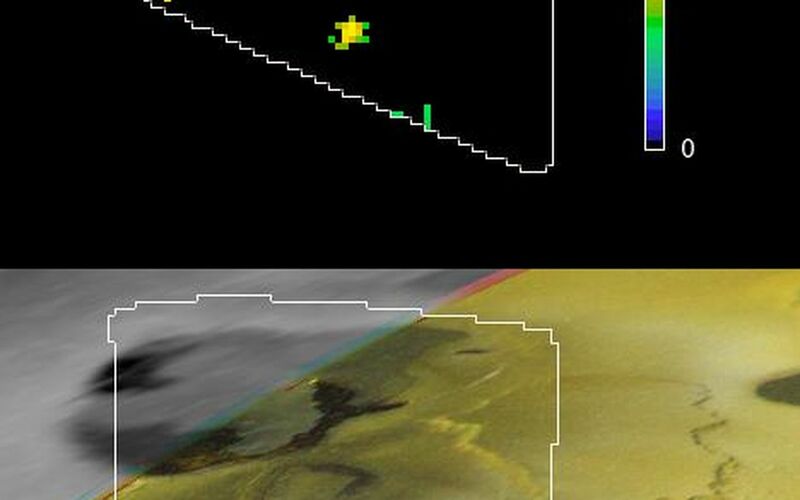 When Galileo flew by Io again in February 2000, the eruption had shifted to the location marked B, where a lava flow shaped like a dolphin's tail is seen. The temperature map shows that volcanic activity is present at many locations in this region. The highest temperatures are found in the three locations marked x, where new lavas may have recently come to the surface. Temperatures (in Kelvin) displayed in the color bar are lower limits. (The range in Fahrenheit is from 460 degrees below zero to 530 degrees above zero.) 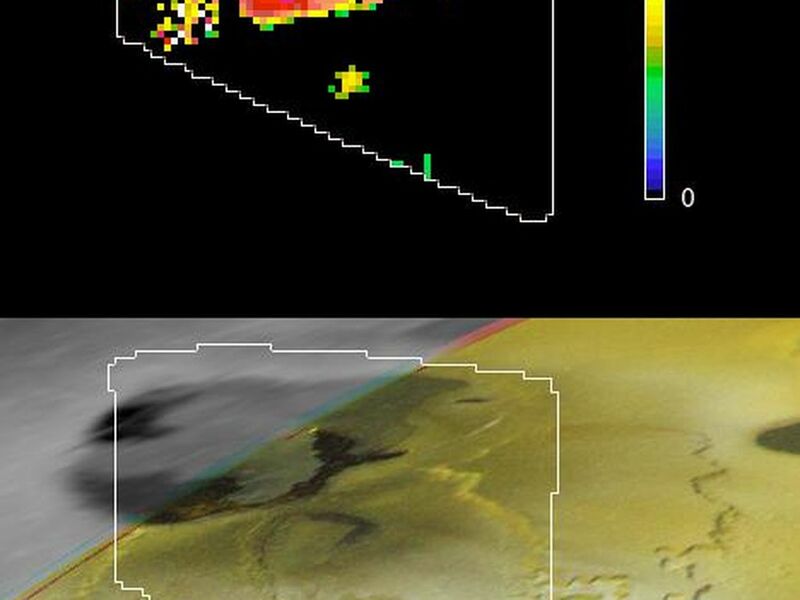 Each picture element averages the characteristics of an area about 2 kilometers (1.2 miles) across; smaller patches may be hundreds of degrees higher. The Galileo camera did not obtain a visible-light image of the Tvashtar region during the August 2001 flyby. Based on the locations of the hottest materials detected by Galileo's near-infrared mapping spectrometer, volcanologists expect that significant surface changes have occurred.